This book was an okay start to the series. The most notable part of this book was that it wasn't the typical "Girl gets thrown into a world she knows nothing about and has a superpower" type of fantasy book, which I really enjoyed. I liked that Sophie knew about her abilities, even if she wasn't really aware of how to use them. Some of the first-person narrative was sloppy, but once Sophie got into her voice as a narrator, the novel picked up. It was fast paced and hard to put down. I liked hearing things from Sophie's perspective, but it also led to having vague details about everyone and everything else, except those that she liked and was friends with -- aka Archer and Jenna. Otherwise there was a disconnect between the actual world and how Sophie saw the world and that led to me having a lot of unanswered questions at the end. I really liked the friendship between Sophie and Jenna and seeing Sophie's fear of what Jenna could possibly do to her, but knowing Jenna wouldn't hurt her because they are such good friends. I thought it was a nice touch to the series to have a non-catty friendship where there is mutual trust and understanding of circumstances. I mean, there was still the catty-ness included but I liked Jenna and I really hope we get to see a lot more of her and her friendship with Sophie. That is one thing I would like to be expanded. I liked the majority of the mythology, but I think it was too heavily focused on witches when it could have looked at the werewolves, faes, and vampires as well. I think having more information about the other mythological creatures that are in the novels would have really expanded the world. 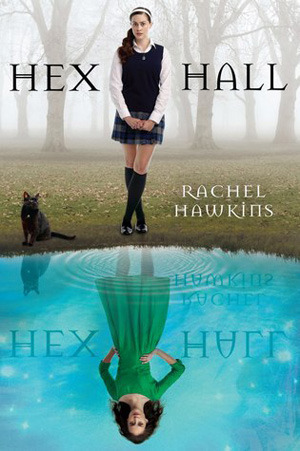 There is also a lack of world-building in the sense that we get some of the background information about why Hex Hall was created, but not why it expanded to include these other mythological creatures in their training/study program. I also would have really liked to know what the classes taught specifically, but Sophie was too focused on anything and everything but her classes to offer much insight into what they teach at Hex Hall. Also, it is never really explained how the Council hides the fact that there are witches et al from the rest of the world after the incidents that bring these students to Hex Hall. It was a little vague on a lot of the details. Overall: 3/5 stars. The book laid the foundation for the series, but there could have been more world-building to explain the situation rather than just by saying "magic."